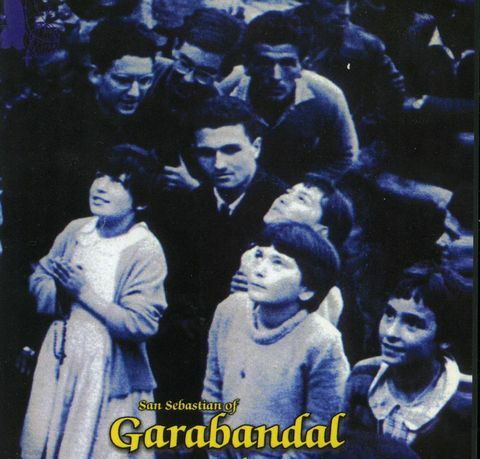 On Sunday, June 18, 1961, the people of the small town of Garabandal often congregated in the village square following Mass at their little church. Two girls, Conchita Gonzalez, age 12, and Mari Cruz Gonzalez, (a second cousin) age 11, decided to sneak away to a nearby apple tree in the yard of their schoolteacher while their parents caught up on gossip. 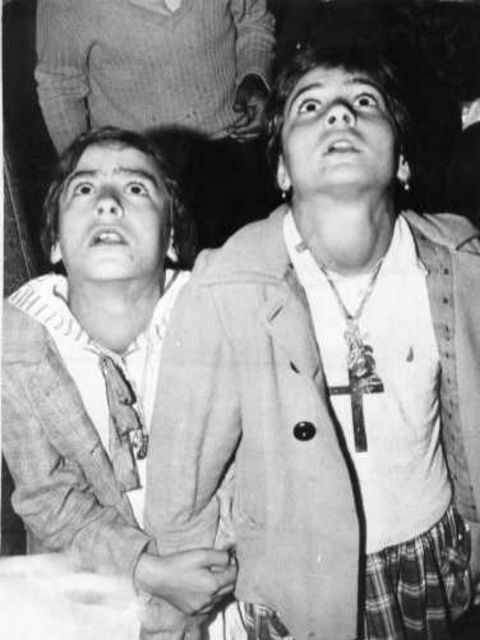 Two other friends, Mari Loli Mazon, age 12, and Jacinta Gonzalez, age 12, had seen them sneak away and followed them. At first they accused the first two of stealing with threats of telling on them, but soon they were all laughing and eating apples. They all fled when they heard their teacher’s loud voice inside her home. They began to feel guilty for their actions and started throwing stones at an imagined location for the Devil so as to please their saddened guardian angels. They grew weary of that play and were startled by a loud clap of thunder. Suddenly, in the rocky lane, Conchita saw a very bright beautiful figure surrounded by a brilliant light. Stunned and speechless, she pointed to the apparition. The girls were first worried about Conchita’s actions until they looked and saw the apparition also – and exclaimed, “An angel!” The angel looked at them but said nothing and disappeared. Frightened, the four girls ran back to the village square, hid behind the church and cried. Their teacher knew them well and could tell they had definitely seen something. They described the angel as a small, nine-year old, childlike figure – but of great strength. He wore a long, blue, seamless robe. He had large, pinkish wings. His eyes were black. The teacher was convinced by their consistent description and strong emotions, but when each girl went home, their families were full of doubt and disbelief. On Tuesday, June 20, 1961, the four girls returned to the rocky lane to pray the Rosary. As they were finishing and rising from their knees, they saw a very bright light which enveloped each of them where they could not see anything else but the light. It terrified them and left them shaken. They did not want to talk to anybody but the priest this time. 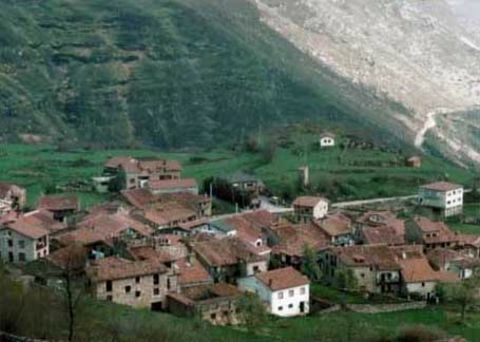 The devoted little village of Garabandal in northern Spain. On Wednesday, June 21, 1961, they returned to the rocky lane to pray – accompanied now by several adults. After their prayers, the angel appeared. Conchita asked the angel what the priest had suggested (Who are you? Why are you here? ), but the angel just smiled and disappeared. The adults were amazed by the physical transformation that the girls had gone into — an “ecstasy” – faces became “pale, transparent-like, and glowing with beautiful expressions.” They radiated an indescribable beauty which impressed the villagers. On Thursday, June 22, the priest joined more villagers as they observed the girls going into an “ecstasy” following their prayers in the rocky lane – as the angel appeared again. On Saturday, June 24, the angel said a word which meant “it is necessary that” and held a sign that contained Roman numerals on it. When the girls responded that they did not understand, the angel just smiled at them. By Sunday, June 25, people were coming from all the nearby villages as word of the visions spread – including five priests and many doctors. One doctor tried to lift Conchita during her kneeling ecstasy, getting her only barely off the ground, and dropped her hard on her knees. Others could hear the sound of bones breaking. Yet, Conchita remained unaware of that action, and the villagers found her unharmed without a scratch or bruise after her ecstasy was over. The other girls found lumps, marks, and pin pricks where they had been tested during their ecstasies by the doctors. The doctors were amazed that none of the girls reacted in any fashion, yet had the marks and bruises from their tests. Because the girls were in the light of the angel and oblivious to anything else around them, they were often surprised at how dark the day had become when the enveloping light of the angel had gone. From June 28-30 the angel reappeared, would not answer questions, and just smiled back at them. But, on Saturday, July 1, 1961, the angel finally revealed why he had come. He announced that the Virgin Mary will appear on the next day, Sunday, as Our Lady of Mount Carmel and would explain more to them. The girls were so excited and talked for two hours with the angel while the villagers could tell that something very special was happening! 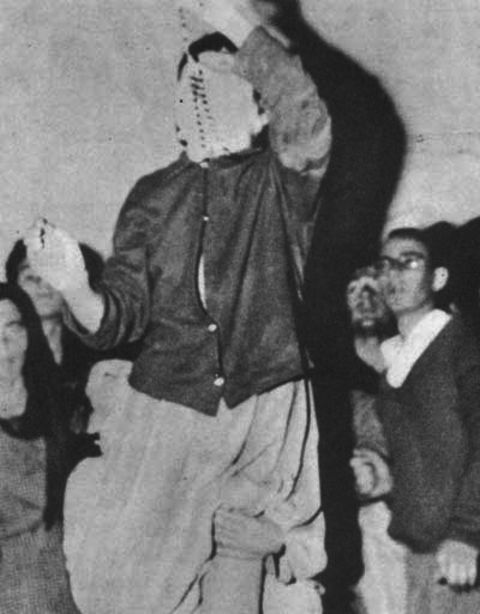 Sunday, July 2, 1961, was greatly anticipated as word spread like wildfire that Mary was expected to appear in Garabandal. The Spanish Civil Guard escorted and protected the four little girls. Many priests and doctors were present. Soon, after 6:00 p.m. in the rocky lane, the Virgin Mary suddenly appeared before them. There was light all around her with two angels standing on either side of her. 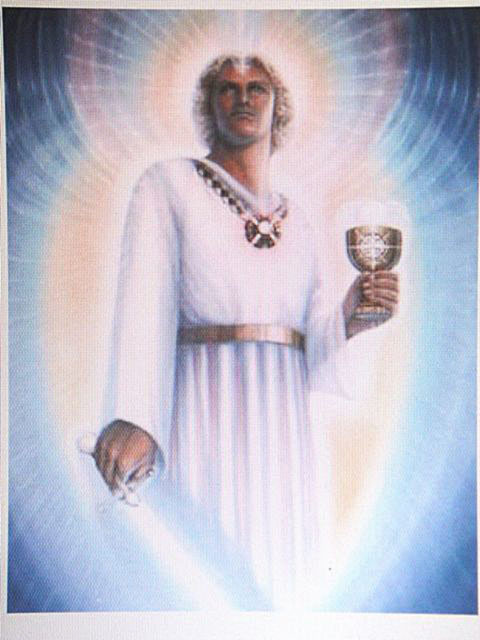 The angel that they had been seeing was now recognized as St. Michael. 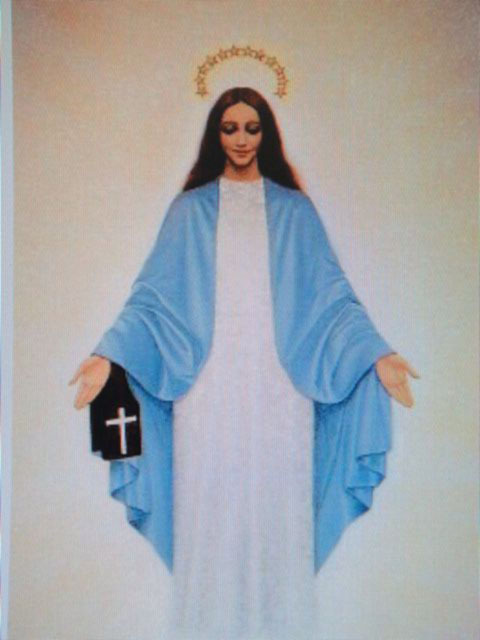 Blessed Mary had a white robe with faint patterns of flowers on it and a blue mantle. She wore a crown with twelve golden stars and held a large brown Scapular (similar to Mount Carmel) in her hand. There was a mountain on one part of the scapular and a white cross on another part. Mary’s long dark hair was parted in the middle and down to her waist. The girls were stunned by the beauty of her face – dainty nose, pretty mouth and slightly full lips – as if she were only 17 years old. Her voice was sweet and pure – and not like any other voice that they had ever heard. To her right they saw a square of red fire which framed a triangle (Trinity) that contained a large eye (God) and some other writing that they could not read. They all conversed in simple, everyday terms as if they were daughters sharing with their Mother. Mary listened lovingly to their simple questions and little stories. When Mary confirmed St. Michael’s identity, Jacinta giggled and said she had a brother named Michael “but without the saint part.” Mary then taught them how to say the Rosary more slowly and with meaning, meditating on the mysteries. Mary said she would return tomorrow – and had been so kind, gentle, and loving with the girls. The girls were thrilled, in love with her already, and so sad to see her go. The villagers were impressed, inspired, and uplifted. This, then, began a series of 2,000 apparitions which would occur with the four girls over the next four years! The second time Mary appeared to them, she was holding the baby Jesus in her arms. They described Jesus as an infant, but “when He looked at us, He seemed to know us completely … and smiled.” Thrilled with seeing him, and just being themselves, they entertained the small child with little games and kisses. They picked up small pebbles for Him to play with. But Mary touched the pebbles, kissed them, and told the girls to give them to the people. The villagers observed the girls handing these stones up to be kissed – which started a major new trend of giving Mary items to be kissed and blessed. Mary seemed to like the idea and complied with the kissing of rosaries, religious medals, wedding rings, or crucifixes. With so many people and so many items piled up for blessing, it would be impossible for the girls to know what item belonged to whom. But during their ecstasies, they not only returned every item correctly to each individual, but their eyes never left Mary – as if she was guiding them to the rightful owners! And, despite some people and priests trying to trick or test the girls, they never made a mistake. Many times people would notice the sweet smell of roses coming from an object kissed by Our Lady. Sometimes Mary would ask the girls to “have (name) kiss the crucifix,” and they would always go right to that stranger in the crowd. Blessed Mary explained that Jesus would perform miracles through objects kissed by her, and that those who wear them with faith and confidence would make their Purgatory on this earth with suffering corresponding to what they would have endured in Purgatory. 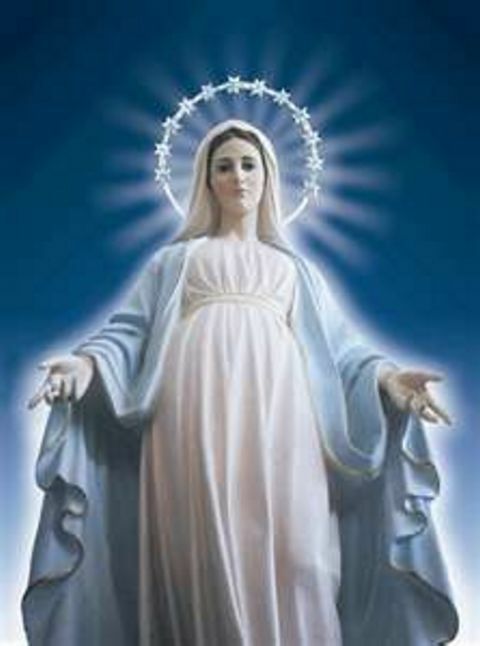 Mary added that God bestows special graces upon those who believe and have faith. Many physical cures (hundreds associated with Garabandal) and conversions have been obtained by simply touching the objects kissed by Mary. The physical actions of these girls impressed many doctors and specialists. As they would fall to their knees with each ecstasy, they would often land on sharp stones and rocks and remain kneeling for extremely long periods of time without moving – with no bruising, cuts, scrapes, or marks. The girls would look in the same direction, at the same spot, and would change direction simultaneously if watching something that moved. Their eyes did not blink or react to efforts to make them blink. Their heads were often tilted backward in very awkward positions looking upward for long periods without discomfort. They were pinched, poked, stuck with needles, and had bright lights shined in their eyes – but none of the four girls ever reacted during their ecstasies. A group of strong men would lift them and drop them – but never would they become hurt, bruised, or injured as anybody else would have. Reflexes, heartbeats, eyes, ears, noses, sensitivity to pain, etc. were all monitored by specialists who concluded that these girls would not react to any outside stimuli. Not even hot summers or the bitter cold of winter affected them. The girls described “three warnings” that they would receive to indicate that Mary would be coming soon. The first was a slight feeling of joy and anticipation. The second call was more like an overflowing of happiness with a great desire. The third calling was an urgent feeling, and the girls would rush to the place where the apparition was to occur. Father Valentin decided to test the girls one day without their knowing it. He had the girls separated in different homes to see if they were influencing each other in any way. By the “third call” the girls all left their homes simultaneously, arriving at the rocky lane at the same moment, and falling to their knees into an ecstasy all at the same time! During an ecstasy they reported that they could only see Mary, each other, and anything that her brilliant light illuminated. They were unaware of other people, doctors running tests, crowds, time of day, weather, etc. It was like they had entered Mary’s protective and supernatural realm as long as Mary was present. When they spoke with Mary, others present would hear a low, guttural, husky voice or whisper instead of their normal voices. Villagers noted many other odd behaviors – being thrown backward to the ground simultaneously without injury or pain, levitating off the floor several inches, moving at incredible speed either forward or backward over the rugged terrain with heads looking up the whole time, never running into anything, never falling or stumbling. Despite adults running at full speed to keep up, the girls were never tired or winded – it was as if they were gliding along effortlessly without even looking at the ground as long as they kept Mary in their vision. On one occasion, observers saw two of the girls walk over a small footbridge while the other two just glided over the small stream as if walking on air! Even when barefoot, their feet were never harmed by sharp rocks, glass, and dangerous terrain. In fact, their bare feet stayed very clean despite the dirty village streets – something that nobody there could fake. Sometimes, during their ecstasies, they would lift each other up without any difficulty to receive a kiss from Mary. After their ecstasies, they could not even begin to lift each other up without struggling and falling. They maintained an aura of peacefulness and normality during the rest of their day – which amazed and inspired villagers. A few days later, the four girls had a very unusual experience. While in ecstasy, they all saw an unusual light and heard Father Luis’ voice, calling each of them by name. He had messages for his brother Ramon and their mother, “Be happy and content, for I am in Heaven, and I see you every day.” Father Ramon did not believe that the girls were talking with his dead brother — until they revealed secrets spoken from Luis that only the two brothers could have known! Later on, his mother was getting ready for bed when she heard a voice say, “Luis is coming.” Suddenly, her bedroom was illuminated, and she saw her son, Luis with two priests. No words were necessary — just seeing him one last time and knowing he was happy in Heaven was good enough for his mother. On July 18, 1964, Holy Mary told Conchita that Father Luis was indeed in Heaven – and foretold that on the day after The Miracle in the pine grove, his body would be found incorrupt. One girl can somehow easily lift another girl for Mary to bless religious items. This was the evidence that so many people were looking for! Because church law states that one can partake in Communion only one time per day, St. Michael had waited until the early hours of the next morning because Conchita had already been to Mass earlier on the anticipated day with all of its celebrations. But the pictures served as proof for those who had given up and left earlier that evening. He was speechless. How could this tiny child possibly know him or his condition and speak to him in perfect English? He decided that this must be an angel. Minutes later, without any greeting, introduction, or identification, Jacinta arrived (in ecstasy) and promptly placed her hand on Father Costigan’s forehead. A short time later, during Mass, his eyesight was fully restored, perfectly, with the last Hail Mary of the Rosary. One of the visionaries levitates about ten inches off the floor. 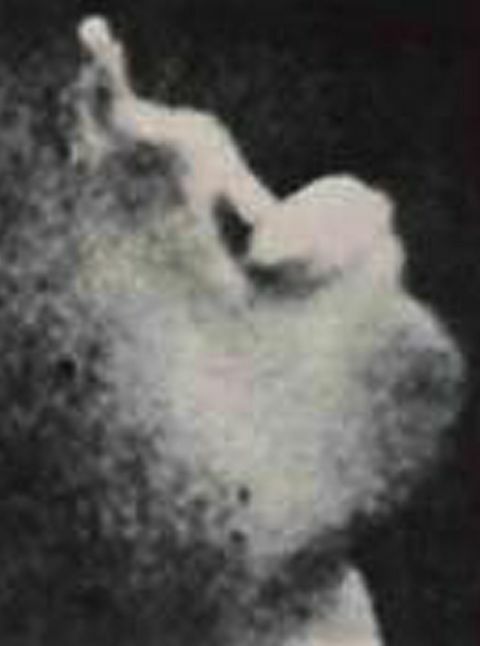 The predicted miraculous appearance of a Host on Conchita’s tongue. Mary also foretold that there would be only two more popes after Pope Paul VI – and that one would have a very short reign. But this did NOT mean that the world would come to an end. Mary also told the girls that they would contradict each other and doubt that they had even seen the apparitions – even deny seeing Mary — in the future! The girls were stunned that she could suggest that they would ever do that, but years later, under great pressure, stress, and threats, all four girls did deny these events with three of them moving to the United States to feel safe (and eventually marry husbands there). Of course, the three that moved away felt safe enough later to affirm their beliefs again. The Blessed Virgin revealed that a 3-stage process would occur in the future. First, there will be a Warning that will “draw the good closer to God and warn the wicked that the end of time is coming.” The Warning will be seen and experienced by everyone everywhere. Each person will find himself alone with his conscience before God, able to know all his sins and what his sins have caused. One would not only become aware of his sins but would feel them deeply and their impact upon others. Hopefully, this could influence a worldwide “purification” before The Miracle happens. The year that this will happen was only revealed to Mari Loli. The Miracle would follow the Warning within the same year. The Miracle will be a supernatural public display in the area of the pines “that will prove and manifest God’s love to us in a most outstanding way.” It will be visible to all in the village and surrounding areas. The sick that will be present shall be cured; the sinners present will all be converted. A sign of The Miracle will remain forever at the pines – but cannot be touched – just photographed. Conchita is the only visionary to know the year, month, and day of The Miracle – and can announce when it will happen, eight days in advance. It is supposed to happen within 12 months of the Warning and occur on a Thursday evening at 8:30 p.m., probably between March and May. It will be in Conchita’s lifetime, and she is approximately 63 years old, now, in 2013. The Chastisement is conditional and can be avoided if the world heeds the messages of the Blessed Virgin. 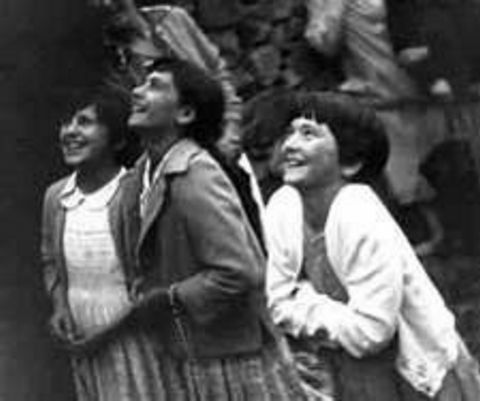 Conchita has seen a preview and warns that when it comes it will be “worse than being enveloped in fire.” Mari Loli and Jacinta were also given a preview during a vision on June 21, 1962. Their screams of terror and gestures to fend off some frightening danger greatly affected all the observers — who then began praying. Father Valentin knew that the Bishop of Santandar must be informed about the events at Garabandal. The Bishop sent priests and doctors to investigate, and they agreed that Conchita should come talk to the Bishop and other specialists – who drilled her and pressured her, trying to convince her that she was wrong. 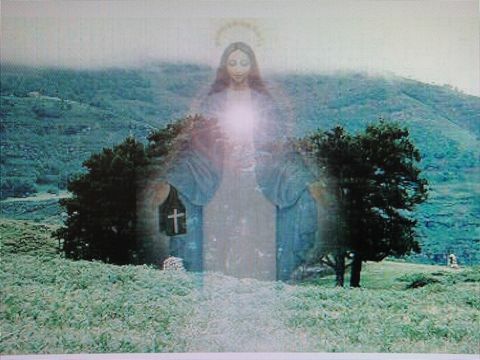 Mary had told Conchita that she would not have any apparitions while in Santandar, so when Conchita told officials that she had not seen Mary (there), they took that as a denial of the events. But a commission was established to study the events at Garabandal. But they did NOT interview ANY of the adults in Garabandal who had been witnesses, NOR did they talk to Father Valentin, who had kept meticulous records of all the events from the beginning. 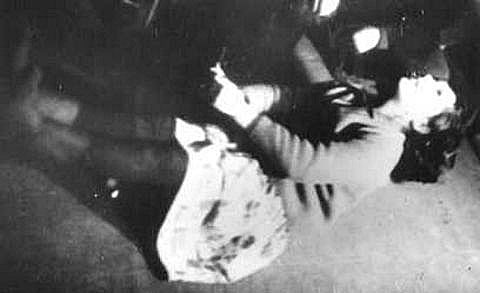 At the end of 1962 Father Valentin was removed because he believed in the apparitions. The new priest imposed many restrictions, yet, the apparitions, conversions, and healings continued. 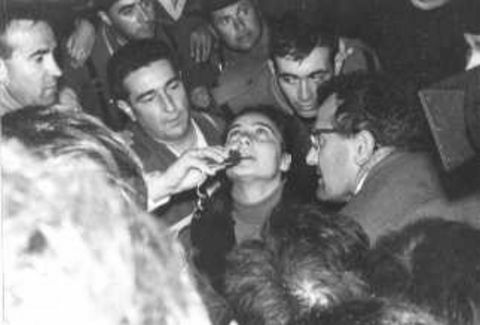 Then, Bishop Aldazabal proclaimed on October 7, 1962, that all priests and religious visitors would be prohibited from gathering at Garabandal. Although local controversy continued over the next years, Rome felt differently about Garabandal and invited Conchita to be interviewed by the Sacred Congregation of the Doctrine of Faith. She met Pope Paul VI and Padre Pio as well. Pope Paul VI told Conchita, “I bless you, and, with me, the whole church blesses you.” In 1975, Jacinta also was invited to Rome and greeted favorably by many Cardinals and Bishops. She impressed the officials of the Sacred Congregation of Faith with her simplicity, sincerity, and dignity. They agreed with her request to lift restrictions against visiting priests, but it was still left to the local Bishop to do so. In 1986, Bishop Val Gallo issued a new investigation and then lifted the restrictions finally in 1987. Although full approval is still elusive, officials are quick to say that they are NOT denying the events at Garabandal (just waiting for the prophecies).